04/01/2015 - The Belgian economy has returned to growth and continues scoring well on broader measures of well-being, but further reforms will be needed to secure fiscal sustainability while promoting employment and competitiveness, according to the latest OECD Economic Survey of Belgium 2015. 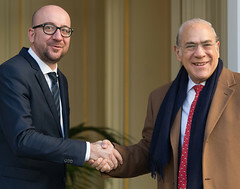 The Survey, presented in Brussels by OECD Secretary-General Angel Gurría and Belgian Prime Minister Charles Michel, says Belgium has been recovering since early-2013. Domestic demand has been an important driver, but external competitiveness still needs to be restored. The Survey notes that public debt now tops 100% of GDP. Public finances will become unsustainable without further fiscal consolidation, particularly spending constraints and efforts to address the unfunded costs of population ageing. A priority is to raise the statutory and effective retirement age, notably by restricting early retirement and other routes for early labour market exit. The Survey also recommends more activation efforts to help older workers stay at work, or return to work. High unemployment and sagging international competitiveness should be addressed via labour market reforms. Wage-setting – and in particular wage indexation – policies should better reflect domestic productivity developments. Reducing labour taxes could boost employment, while the lost revenue could be compensated through increases to taxes that are less harmful to growth, such as those on consumption and the environment, the Survey said. Higher taxes on capital income, such as capital gains, could also be considered to offset revenue losses, the Survey said. To ensure more equitable growth, targeted measures are needed to improve immigrants’ integration into the labour market. Expanding diversity plans in firms, training offers and skills validation would be a good first step. But equally important will be general reforms to make the education system more equitable, so that disadvantaged students can fulfil their potential. Increasing support for the rental market, by expanding rental allowance schemes and stimulating the supply of rental housing, can reverse the deteriorating affordability of housing, especially for low-income tenants. Removing the tax deductibility of mortgages will eliminate fiscal benefits that favour high-income households. An embeddable version is also available, together with information about downloadable and print versions. For further information, journalists should contact the OECD Media Division (+33 1 45 24 97 00, news.contact@oecd.org).